The beauty of a garden is that it’s a living design piece. That means it can grow with you and change as trends and fashions change. Here are the trends you should consider in 2019. There’s no reason you can’t enjoy a holiday every day by turning a portion of your backyard into your very own backyard escape. You need to make the space private, tranquil and even include some creature comforts like an outdoor kitchen, a music connection and even a well-placed fire pit or water feature so you can really drift away. Read our 10 Ways to Create a Backyard Getaway for further information. If you have a structure in your backyard, whether it’s a gazebo, pergola or just a garden shed, you need to use it well. Try and decorate by surrounding them with garden beds or even use them as a base for creepers. Whatever you do, make it beautiful because anyone that looks into your backyard will be automatically drawn to these focal points. The backyard is for your pleasure, the front is for visitors. 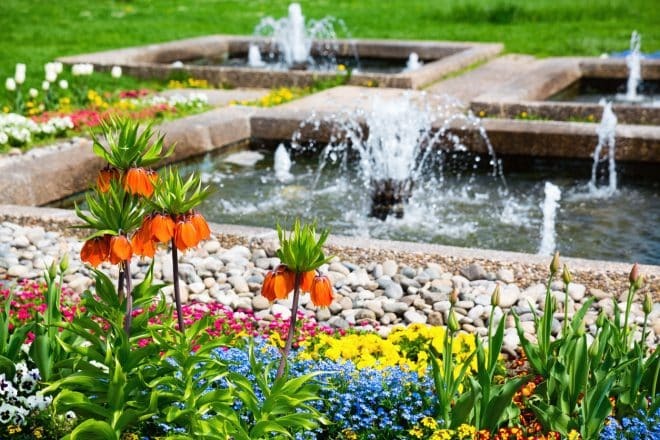 Your front yard needs plenty of attention and 2019 is just the year to do it. Add a beautiful front gate or fence and include plenty of plant life. Laser cut screening is a great way to add some cost-effective art to your front garden. This trend just isn’t going away, probably because it’s the best way to use whatever space you have in the garden. Vegetable gardens look beautiful, they’re good for the environment, and you get to grow beautiful, fresh food for your family and friends. You don’t need much space, and in Victoria’s climate, there isn’t much you can’t grow. Go for a typical garden bed, or go vertical to make the most of your space. You’ll be surprised by how much you can produce, and if you follow a system, you’ll be picking food all year. Read our blog on Hints and Tips for Planting an Edible Garden in Melbourne to begin your journey towards homegrown food. Not for you, but for local wildlife. We’ve taken up a lot of their land and knocked down a few of their homes to build our own, so 2019 is the time to give back. If you have young kids, they’ll love seeing all the comings and goings of wildlife. All you have to do is put some water and food around your garden, and you’ll see all sorts of birds, bugs, reptiles and even a few marsupials coming to visit. Of course, watch out for the odd snake and creepy crawlie that you don’t want the kids and dog to play with. Apart from that, just enjoy the feeling of turning your backyard into a wildlife sanctuary. With some well-placed retaining walls or even a raised decking, you can extend the living space of your backyard. By creating levels, you can also devote each space to a different feel. One could be hardscaped, one could have lawn, and one could be used as a garden bed. You’ll be amazed by how this revolutionises your property and opens up design choices you never thought possible. This is probably the cheapest and easiest trend to follow. So many people forget to illuminate their garden, meaning it can only be enjoyed during the day. Don’t waste your space, use some outdoor lighting to light up the strong points of your backyard, and hide the rest. You can generate beautiful contrasts, and it creates a beautiful peaceful feeling when you want some outside time at night. Is 2019 the year you want to revolutionise your backyard? Get in touch with the landscaping experts at Everlast Services. We’ve got the advice and talented landscapers you need to turn your garden into a selling point for your home.